Do Higher Public Sector Wages Increase Corruption? I have always wondered about the reasons for corruption and its harmful effects on a country. It is a huge problem and a major cause for growth inhibition and stagnation in the third world countries. Corruption has plagued the economic and social foundations of these countries for a long time, but it is only recently that public awareness about this issue has risen. 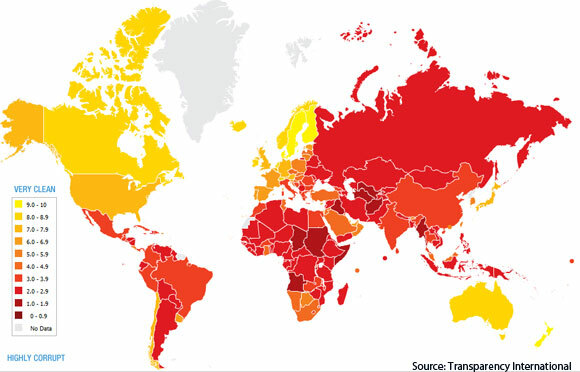 The Corruption Perception Index Rankings released by Transparency International rank some of the fastest growing economies of the world — like India, Indonesia, Russia and China — as some of the most corrupt. A major reason why illiteracy and poverty continue to tarnish these countries despite government policies is because of corruption at every level of the supply chain. That is why corruption has become such an important topic to study today. And that is precisely my area of study for my Economics Honors Thesis. Specifically, I am focusing on the effects of wages of government officials on corruption in developing countries. A majority of illegal money exchange happens in the public sector. In most developing economies around the world, public sector salaries tend to be lower than private sector salaries. These wage differentials between civil servants in the public and the private sector represent an important variable in the quantification of corruption levels within a country. Understanding these effects over time will help us know the relationship between the wages of civil servants and corruption. One study has shown that the amount that public sector employees from Albania earn through corruption is around 257% of their actual salaries. That is a shocking result, especially given the fact that if you look at how this affects the entire country — corruption accounts for more than 16% of Albania’s GDP! The goal of this economics research is to look at how the changes in public sector wages over time have affected corruption. I also aim to understand these results in terms of what it means for the anti-corruption policy development in the country. For example, if an increase in public sector wages actually increases corruption, then anti-corruption policy should not concentrate on increasing wages, but instead look at providing incentive based government work schemes and enforcing tighter regulations.